Some areas are still at risk of flooding from the biggest tidal surge for half a century, the Environment Agency has warned. It is urging people to keep checking the flood situation in their area. The warning comes after thousands of residents who fled the expected devastation returned home. Fears of widespread flooding have diminished, but five areas in the north east and East Anglia remain on "flood watch" alerts. The Environment Agency defines a "flood watch" alert as flooding of low-lying land and roads expected. Tides peaked without major breaches of sea defences with waters that were nearly 8in (20cm) lower than originally feared and passed without causing major damage. The North Sea surge had been moving south, combining with high tides and strong winds to create flooding risks along the coast. Environment Agency chief executive Barbara Young said: "As the main time for concern has now passed in Great Yarmouth, it's easy for people to think that the risk of flooding has passed for everyone. "In some areas it has, but this tidal surge is affecting a large part of our coast and it affects parts of the country differently. "That is why we are urging people to check their local flood situation." There were several breaches of sea walls in Norfolk and Suffolk and residents of tide-locked areas such as the Broads have been warned there could be more flooding. Thirty people were rescued from a sheltered accommodation unit in Lowestoft, Suffolk, while in Norfolk emergency services carried out six rescues in the village of Walcott where storm waters breached the sea wall. The largest swells were in Felixstowe, Suffolk, where sea levels rose to 2.84m (9.3ft) above average, and Great Yarmouth at 2.8m (9.2ft). The water levels in Felixstowe and Great Yarmouth were the highest since 1953 when 307 people died after high tides and a storm saw a tidal surge of 3.2m (10ft 6in). Eight severe flood warnings across East Anglia have been lifted by the Environment Agency. 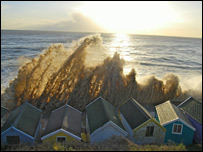 Tidal surges occur when wind and low pressure cause water to "pile" up in combination with high tides. For more information on flood risks call the Environment Agency's Floodline on 08459 881188.